A: I try, you guys. I really do. As hard as it might be to believe given my track record, I try not to talk about Batman all the time in this column. But then a question like this comes along that starts me thinking, and, well, here we go again. So come on, Larry: Let's talk about Azrael. 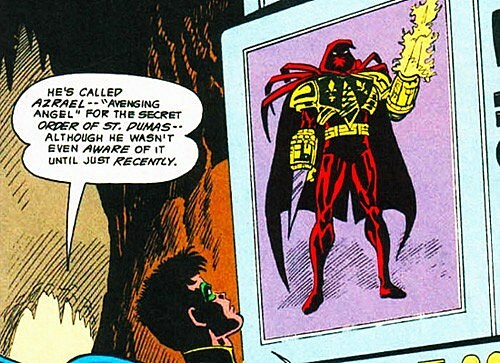 For those of you who aren't familiar with him, Jean-Paul Valley -- better known as Azrael -- was a character introduced in 1992, presumably because there weren't enough characters running around the DC Universe who looked like they were made specifically to be action figures. Seriously, the dude had clip-on accessories with light-up action features in the comics. He was secretly an assassin trained by a sect of the Knights Templar called the Order of St. Dumas -- so secretly, in fact, that he didn't even know this himself, having had all of the skills necessary for battling heretics and maintaining wrist-mounted flame swords programmed into his subconscious mind. He ended up falling in with Batman, who at the time was rolling with a group of associates that included a sidekick, a butler, a hunchbacked auto mechanic and a dog, all of whom were either living in his house or spending the vast majority of their time in his unfinished anti-crime basement. 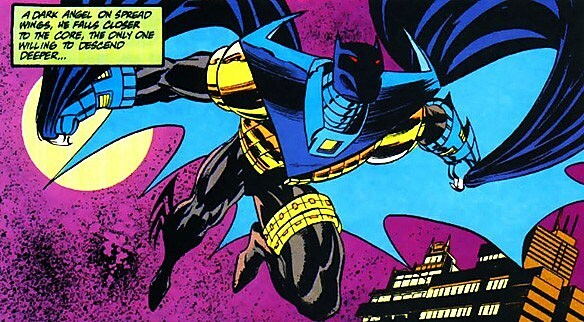 When Bruce Wayne was injured during Knightfall, Valley took over the role of Batman himself for a brief tenure that included a redesigned costume and an edgier, more violent take on crime-fighting, earning him the nickname "AzBats" from the fans in order to distinguish him from, you know, the good Batman. As for where he falls in the pantheon of legacy heroes and replacements, well, I think it's pretty clear that he was never really meant to be a permanent replacement for Bruce Wayne, even with the pretty temporary level of "permanence" that we've all come to expect from super-hero comics. But I'm not sure that calling him a parody is really the right way to describe him either. While "parody" might not be quite the right word, there's clearly an intent in this design to capture the zeitgeist of the '90s. The bulky armor, the helmet and sinister red eyes, the sharp points coming off of his shoulders and gauntlets, the elimination of trunks and boots in favor of some weird kind of footie pajama leotard underneath. I mean, the Liefeldian thigh pouches alone pretty much say it all. 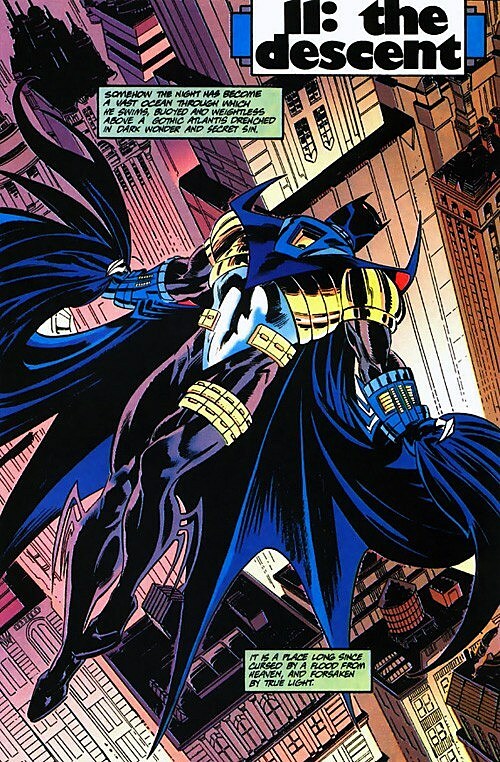 And while we're on the subject, it's worth nothing that as much as this looks like a pure product of its era, here we are 20 years later with a DC Universe decked out in the direct descendants of this costume. No trunks, just seams, armor, and points. But that's another column. The point is, the creators of the alleged "New Batman" knew exactly what they were doing with this suit. This was a group that included the legendary writer and editor Denny O'Neil, the legendary artist Jim Aparo, and an up-and-coming artist who designed the costume called Joe Quesada, probably better known today as the guy who's been running Marvel Comics for the past 11 years. A radical departure from a classic costume like Batman's, released at what was billed as the climax of a massive event, doesn't go out the door without some serious intent behind it. Sadly, I wasn't present during any of the meetings -- for some reason they weren't consulting any 12-year-olds from South Carolina, even if they really liked Batman -- but if I had to guess at just what it was, I'd say the intent was to give the fans what the fans thought they wanted. At least for a little while. After all, the whole story of Knightfall and Azrael kicked off in 1992, during a time when comics were absolutely dominated by characters of the Badass Killer variety. Wolverine, Cable, the original bunch over at Image, hell, the Punisher was supporting three ongoing monthly comics, and as much as I love that guy, I'm pretty sure it wasn't his compelling origin or character development that made him so popular. It was the fact that he was a ruthless killer. 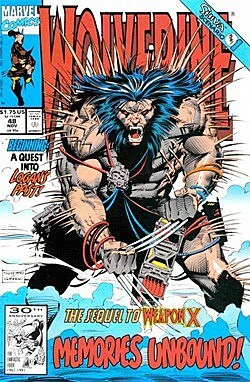 Same goes for Wolverine: Claremont, Byrne, Cockrum and Miller may have made him a surprisingly rich, deceptively complex character, but the reason most people were reading those comics was because he had knives sticking out of his hands that he used to stab ninjas. Believe me, as a kid who was ten years old in 1992, I can totally confirm that this is a premise with huge appeal. And comics fans being what they were, they wanted everything to be like that. Well, I say "comics fans," but that's not really fair -- fans of all media tend to be like that. Doom's great and becomes a huge success, so we get a ton of first-person shooters that are variations and improvements. Street Fighter has kids lining up around the block, so Tekken and Mortal Kombat and Virtua Fighter become the main attraction at the arcades. Grand Theft Auto 3 is revolutionary and phenomenal, so suddenly everything's got to have an open world sandbox. I kind of got hung up on video games there, but it holds true across every element of pop culture. The Beatles are great, so we get the British Invasion. Twilight sells a jillion copies, so now every Young Adult novel is required by law to have a shirtless werewolf in it. Lord of the Rings makes a billion dollars at the box office, and suddenly someone thinks it's a good idea to make Dungeon Siege: In the Name of the King. There's this weird thing that happens in our brains where things that are good just confuse the hell out of us, so that the thought process becomes "This was good, therefore all good things must be similar to this," and rather than figuring out the things that actually make it good, they just go with the surface elements. And while it happens with everything that goes out to a mass market, it happens a lot with comics, and usually with a huge impact. I've mentioned this before -- and this tangent I'm on is about to hit critical mass unless I get back to the point so I'll keep it brief -- but the people who read comics have a long and storied history of reading great comics and learning the exact wrong thing from them. Watchmen is the perfect example. It's a great comic, but half the people who think it's great walk away having learned the lesson that "mature" comics are mature because people get raped and that heroes should all be borderline psychotics because that's real, and not because it deals with complex issues in a way that doesn't necessarily present easy solutions with simple moral clarity. Which brings us, at long last, back to the comics fans who loved Wolverine, the Punisher, and the rest of the gun-toting, ninja-stabbing heroes that we all associate with the magic summer of 1992. The fact that these characters were such a massive success was apparent just from the numbers, but there was something else in play, too. Conversation. Specifically, the same dumb conversations people are still having today about how Batman should totally just kill dudes, because it's lame and unrealistic that he doesn't. Nevermind that there are clear reasons crafted over decades of rich stories about why he wouldn't, killing dudes is what Wolverine and the Punisher do! And since those guys are cool, Batman has to do that stuff too or else he's not! And he better wear some body armor, too, because otherwise this whole thing might end up being silly. It's the sort of thing you heard (and hear) in every comic book store in the country, and with the level of direct access that comics fans had even then to creators and editors through letter columns and comic book conventions, I'm sure they heard it too. It seriously cracks me up to this day that they essentially published years of comics for the sole purpose of saying "Fine, that's how you want it? Here you go. Enjoy." They made a character out of pure sarcasm, and he had his own ongoing series for a hundred issues. Hilarious. Or at least, that's how I look at him. I could be wrong about the movies behind his creation. But what I do know beyond a shadow of a doubt is that he was never intended to actually replace Batman. It's interesting that you bring up characters like Kyle Rayner, because from where we are now, it's easy to look back and see where the intentions were there. 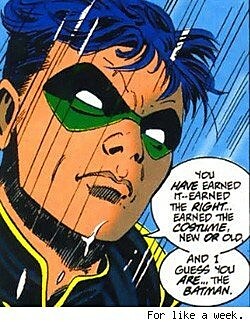 It's easy to spot that Kyle Rayner, Wally West and Tim Drake were clearly meant to serve as permanent replacements, because we can go back and see that there were years and years of stories that were devoted to them. There's a commitment involved in their stories, in that they are THE Green Lantern / Flash / Robin for a significant amount of time. They have their own adventures and development that are independent from their predecessor's. With a temporary replacement, that's almost never the case: They're there in the story specifically -- and exclusively -- because of how they relate to the person they're replacing. AzBats is the perfect example, because for one thing, Bruce Wayne is never not in those comics, and he's usually sitting around talking about how he needs to get healed. That's kind of a tipoff. For another, the seeds of his return were planted in that story from before the beginning. A lot of readers focus specifically on Knightfall because, well, it's the good part of that four or five years of Batman comics, with the memorable stuff like Batman fighting all of his villains and that big Jim Aparo "BREAK YOU!" page. It's easy to stop after that and just go "oh, and then he eventually got better because comics," but that's not really the case. The fact of the matter is that Knightfall is only a part of a larger story that ran for way too long three or four years, that was always meant to involve Bruce Wayne's return as The Real Batman. How do I know? Well, if you're not familiar with Knightfall, Knightsend, Knightquest and Prodigal, you might just assume that Bruce Wayne recovered from a broken back and got back into top-notch crimefighting shape through some goofy comic book science that just erased his injury, and you'd be right. But the actual circumstances of it are one of the goofiest things to ever happen to Batman, to the point where I'd stack it up against any weird bit of the Silver Age in a heartbeat. See, Bruce Wayne's neighbor's physical therapist was Shondra Kinsolving, and when he was paralyzed, she became his physical therapist and love interest, and it just so happened that she also had psychic broken back healing powers. But there's a catch! If she used them to fully heal Batman, she would forget Bruce Wayne's secret identity, regress to having the mind of a five year-old, and exit at panel left, never to be seen again. So she did, she did, she did, and with the exception of a one-panel cameo in the best-left-forgotten Hush, she did. That's how Batman got his groove (and lower extremities) back. Psychic physical therapy. So why is this an indication that Batman was always meant to come back, when Barry Allen returning from the Speed Force or Hal Jordan being possessed by a giant yellow space bug isn't? Because Shondra Kinsolving made her first appearance two months before Bane. Five months before Knightfall kicked off, they had the source of Bruce Wayne's inevitable return already established. Even beyond that, though, it's clear just from the storytelling that AzBats was never meant to be a permanent replacement. I managed to talk about Knightfall at length before without ever really mentioning Azrael, because the story isn't about him. It's about Bruce Wayne. Azrael's certainly in it, but the point of those stories isn't to show us how Jean-Paul Valley grows or changes in his role as Batman, the point is to show how he contrasts with Bruce Wayne and why Bruce needs to come back and kick Azrael out of the cowl. Even when he's "replaced," Bruce Wayne is at the center of that story every step of the way, and everything about it revolves around him. I hesitate to even mention this because it's the Comics Internet equivalent of chucking rocks at a hornet's nest, but it's a really similar situation to what happened with Stephanie Brown when she was a replacement Robin. It's pretty clear in that story that she was never meant to be a permanent replacement. It's not just that she was only Robin for six months, it's that Tim Drake never left those comics. She's set up explicitly within the story as a contrast to him, and because of that, he's still the focus of what's going on in the book. Even her apparent death in War Games comes as a result of trying to prove she's as good as Tim was. There's another interesting contrast with the two characters that comes up in your question of whether AzBats was meant to be a permanent change that just didn't catch on and led DC to regress things back to the way they were. That's definitely not the case for him -- there's a pretty clear arc to his stories -- but I'm pretty sure that it actually was true for Stephanie Brown. Not with her role as Robin, but with her death. Like I said, I wasn't there, but if I had to guess, I'd say that her death was meant to be a (more or less) permanent consequence of War Games and its apparent mission to prune the Bat-Family tree. Except that it was one of those things that didn't catch on. It turned out that people actually really liked the idea of the Batman family having an upbeat young girl in it, which led to Stephanie Brown's eventual resurrection and promotion to Batgirl. 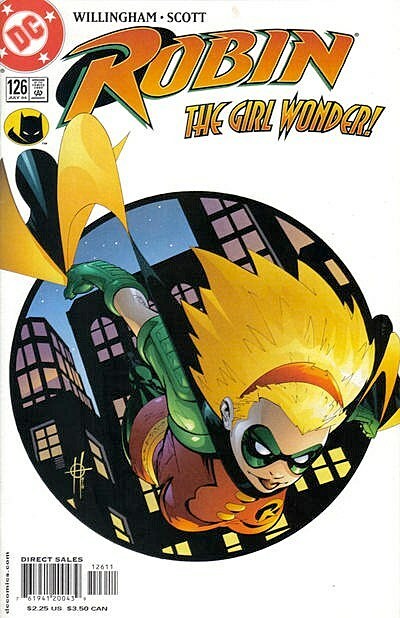 Of course, there was also the fact that there was already a Batgirl at the time who ended up walking off-panel and hanging out in limbo for a year before being shuffled into a new codename, and the fact that Stephanie Brown's tenure as Batgirl ended with Barbara Gordon returning to the role that she had very clearly been intended to abandon forever. So, you know. There's that. The moral of the story? In comics, nothing is permanent, but there are some things that are far less permanent than others.